If you’re struggling with obesity and you’re ready to lose weight, the UPMC bariatric surgery team can help you find a healthier, happier you. Our multidisciplinary approach includes personalized care from all our team members — before, during, and after your surgery. 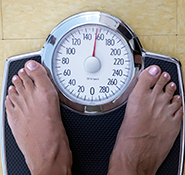 You could be a candidate for weight loss surgery if you are 80 to 100 pounds overweight or have a Body Mass Index (BMI) over 40. Learn more about the UPMC Bariatric Surgery Center of Excellence.